Somewhere between 45-50 days after hatching, young Gyrfalcons take a leap from their nest and fly for the first time. The clip above shows an angsty female preparing herself for that first jump. Her two siblings, both male, had already left the nest. This fact added to her anxiety as they called from outside of the nest. Last year I put some effort into seeing a Gyrfalcon’s first flight, but was never in the right place at the right time. This year, I’m making another attempt. The clip above – as seen from a tent through our Zeiss Diascope – is as close as I’ve come to seeing a first flight. 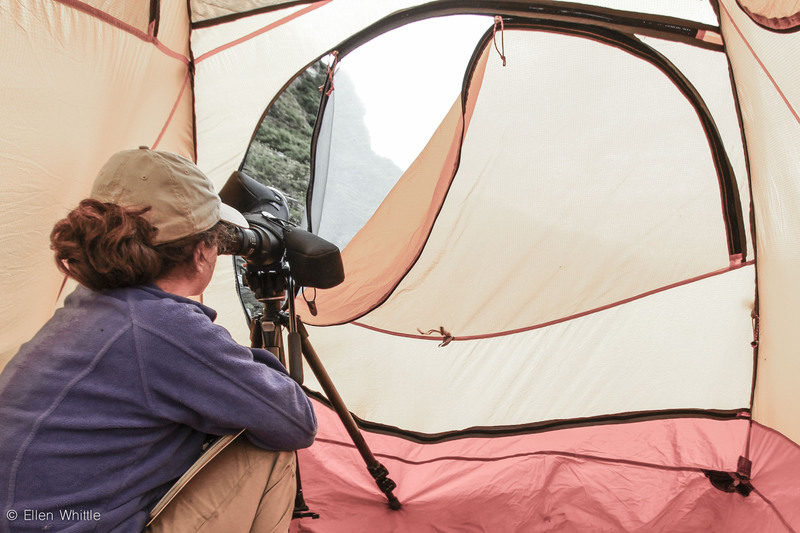 I spent hours with my field partner Ellen in a tent outside of the eyrie waiting for the bird to make the leap. The clip shows the closest she came. After this intense flapping bout, she sat down and went to sleep. We had to leave before the bird left the nest, but the time spent watching her was worthwhile. First hand study is invaluable. We live in an interesting world where technology gives us so much, so fast, so often. We are able to learn at such a high pace, and research is no exception. For instance, I’m gaining insight into multiple nests using motion-sensor cameras. 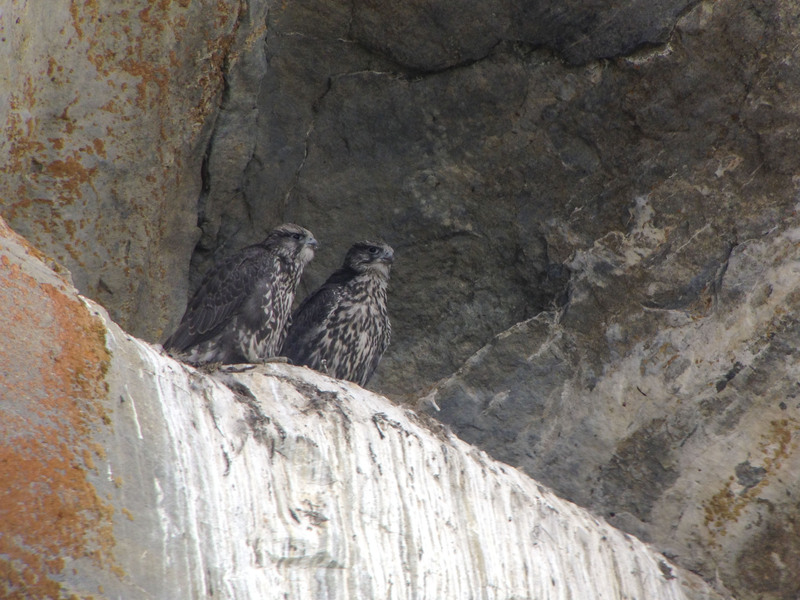 This provides me an in-depth exposure to Gyrfalcon nests at a higher rate than ever before . This is all due to the camera technology. But I’m missing out on a slow pace digestion of first hand observation. I’m missing out on the whole picture. To get the full perspective, and truly see what it is like in the nest, I need to watch them myself. While I watched, I took notes on behaviors. I also did a bit of field sketching. 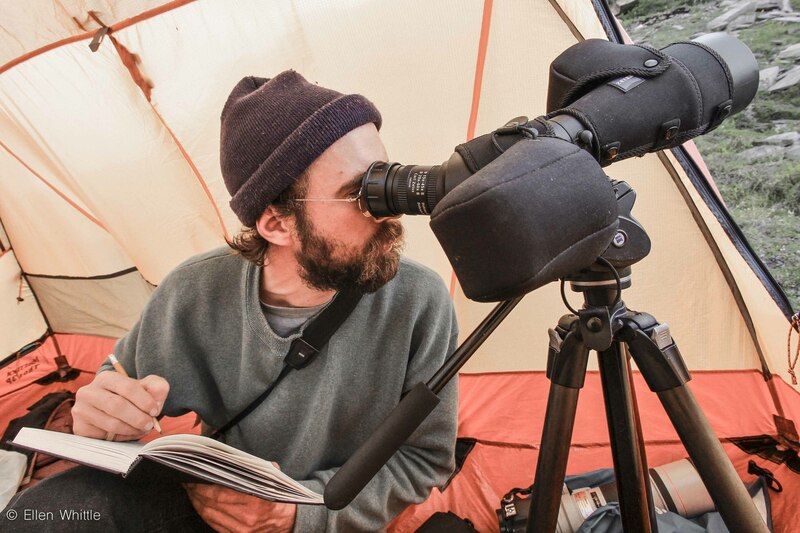 Field sketches force you to focus, and digest very small details that can heighten your understanding of your subject, but also enhance your observation skills. Besides all that, it is an enjoyable way to pass the time while the nestlings sleep. Ellen and I took turns watching the nest. We were able to see two prey deliveries during our time watching. A male fledgling returned after one of the prey deliveries, hoping to get part of the meal. The female, however, would not oblige. I most enjoyed watching their behaviors. The birds interacted with one another in an endearing manner. They would pick at each other, as if preening. I wasn’t quite sure if this was curiosity, playful, or truly preening. They would also watch flies buzz around the nest, as if they were about to pounce. You could see the predator engineered mind in the way they followed the flies. They were figuring out what they needed to do to survive. Although we missed the first flight of the female, we’ll have a few more opportunities to try with other nests. This means more hours behind the scope to watch, and more hours to learn. Your posts are the best B. Slow science… kinda like slow food- all about savoring the experience! A few of years ago I trekked out to a Prairie nest I thought was ready to fledge and nestled down in a comfy shaded spot for the duration. It ended up being about a 5 hour deal to catch a glimpse and a pic of the three that made the jump that day. It’s amazing how much you see when you have no where to be but where you are. I’ll never forget it. Hope you’re making good memories as well as good science. Thanks Mike. I’m doing my best to – as the cliche saying goes – smell the roses during my time here with Gyrfalcons. Who knows when I’ll have these opportunities again. I’m thinking I need to do the same thing with some Prairies. Let’s plan on it, eh?